The historic Kantishna Mining District at the very end of the Denali National Park Road, and the site of several up-scale lodges, was once the scene of a chaotic gold rush. 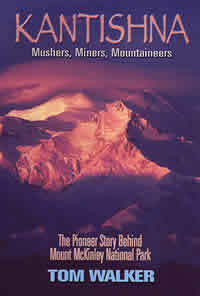 If you are planning a visit to Denali, or just enjoy exciting tales of the Far North, then here is the book for you. In the aftermath of the 1898 Klondike gold rush, hardy pioneers forged through trackless wilderness on foot or by dogteam to prospect every remote drainage in Interior Alaska. A gold discovery in 1905 in the Kantishna hills near Mt. McKinley sparked a wild stampede for riches. Very few of the hundreds of stampeders got rich, others went broke, and a few died in the sullen, silent places in the very shadow of North America's tallest peak. The Kantishna is rife with stories of courage, loyalty, and challenges met head-on. Bouts with wild beasts, isolation, disease, accidents, and cosmic cold. Here too are darker tales of armed robbery, attempted murder, suicide and insanity. Market hunters slaughtered the wildlife. Unscrupulous trappers poisoned animals for their fur. Mt. McKinley drew adventurers of another sort. For over a decade a diverse number of eastern sportsmen and sourdoughs challenged the icy slopes. They risked privation, frostbite, and death to be the first to reach the top. The stories of defeat and deception set the stage in 1913 for the ultimate triumph. Out of the detritus of the Kantishna stampede emerged two men of a different stripe. Two men of adventure and vision, who rose above the lust for gold, to fight for a national park where wildlife would roam free of the epic slaughter that accompanied America's northern expansion. Carving a national park out of this wilderness would not be easy. Alaskans would fight to protect their way of life. Here are stories of these hardy, sometimes desperate, Kantishna pioneers, tales similar to those that inspired Robert Service and Jack London - only these stories are true. McKinley Park: People of the Pioneer Park. Madams, Marshals, Moonshiners, and Madmen, some of the characters that figure in the early history of Mt. McKinley National Park, the forerunner of Denali National Park. For four long years after the park was created, the residents of two communities, McKinley Station in the east and Kantishna in the west, used the park as they always had, hunting, trapping, and prospecting without restraint. The wildlife slaughter gained national attention. Finally, the Government provided funds to hire the first park ranger: Harry Karstens, a man of courage, strength, and tenacity. Single-handedly Karstens built a headquarters and attempted to enforce the park regulations, meeting opposition at every turn. Locals viewed McKinley Park as merely a playground for Eastern millionaires and were not about to give up their hunting and trapping rights. Karstens faced down tough, dangerous foes who threatened his reputation, life, and family. Carving a national park out of the wilderness of Denali was a daunting task. People here lived life on the edge. Here are stories of sourdoughs, shoot-outs, and shady ladies. Stories of jousts with bitter cold and wild beasts; wilderness and wild fire. Battles with bureaucrats and bounders; poachers and prospectors. Despite long odds, Karstens overcame nearly insurmountable challenges to develop and protect Mt. McKinley National Park, the crown jewel of Alaska. , Softbound, 390 pages plus 50 b&w photos and maps ISBN: 978-1-57510-145-3 $21.95 plus postage. See STORE to order.